Sometimes people — not you, of course! — dismiss fiction as being a time waster. Unimportant. Irrelevant. Frivolous. Brain rotting. I hate it when I hear that. Don’t you? This past month my husband and I watched a show on TV called Hunting Hitler. The premise was that the US government had released documents that showed the CIA had been hunting Hitler in the years after World War II because there were sightings of him throughout Argentina and even into Colombia. The idea was that there was no forensic proof that Hitler died in that Berlin bunker and that the eyewitnesses who’d dealt with his body had, in actuality, taken a body wrapped in rugs and been told it was Hitler. Now the show didn’t really change our minds on what we’d always learned in history class, but what was interesting were many of the historical facts that the show brought out. Things like how much Spain was pro-Nazi, despite their remaining “neutral” during the war. After watching the show, it seemed very clear that Spain wasn’t neutral at all. Why would that be? Well, before World War II began, Spain went through a civil war. And Hitler used that opportunity to do a test run, so to speak, of some of his military. He supported General Franco — who ended up winning that war and was the ruler of Spain during World War II. Some say Franco would not have won without the backing of Hitler and Mussolini. My husband had never even heard of this Spanish civil war. He had no idea that Hitler had supplied Luftwaffe bombers and other equipment and supplies to Franco. This was all new info to him. But I knew it — because of Bodie Thoene’s Vienna Prelude that I read back in high school. None of that info was knew to me. This scenario has happened a number of times throughout my adult life. Some little-known topic of history or some interesting tidbit will come up in conversation, and if I knew about it, it was often because I’d come across it in a novel. I feel like I’ve learned a lot from fiction! When writing Kept, I did some research on Grant Park in Chicago, the gorgeous lakeside park where my story takes place. And I learned some historical facts about the park that I’d never known. Most of that info didn’t make it into the book, but one new-to-me fact did — that the Chicago Cubs built a stadium in Grant Park after the Chicago fire. As someone who grew up a Cubs fan, I have to say that it doesn’t seem like anyone knows hardly anything about the Cubs pre-Wrigley Field. So more facts from fiction. The best and most important things I’ve learned from fiction, though, have been on the spiritual side. I clearly remember reading a Terri Blackstock book where, at the end, she challenged me on whether or not I was spending time in the Bible. 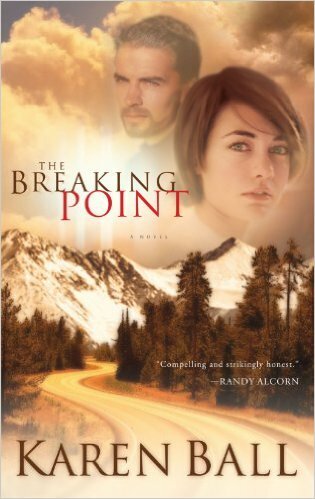 Karen Ball wrote an amazing book called The Breaking Point that dealt with a biblical marriage. That was the first time someone ever said to me that marriage was about God making me more like Him and not my personal fairy tale. That bit of wisdom truly changed my life. And as the author of Kept, I’ve heard more than one reader say that the book made them reevaluate how they treat the lost, how they’re witnessing to those around them that they’ve always chalked up as too far gone. What a thrill it is to hear that! That’s why I love — and write — Christian fiction. Yes, I can share fascinating bits of trivia and history with my readers. Yes, I can learn about things new to me. But best of all I can be challenged spiritually. I can read about another life and see how their struggle might apply to me… and grow from it! Your turn: have you read any books that taught you new info? That challenged your spiritually? Of course we have to compare the spiritual info in a novel to what the Bible says. That’s always the first step. But I’d love to hear how Christian fiction has taught you and helped you grow. Do share! Not sure whether these comments are always read by the blogger. My favorite fiction genres are romances and cozy mysteries. As a reader, I appreciate learning and being inspired by the books I choose to read. One of the great things about using an e-reader and Amazon, is the diversity of free or sale material. Over the past few years, I met many new authors. 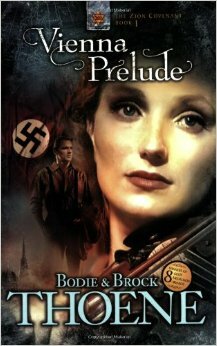 As a German American whose parents and relatives lived in Germany during WW2, I also read Vienna Prelude as well as many other historical fiction and non-fiction books. Presently I am reading The Wedding Dress by Rachel Hauck. I learned that soldiers’ dog tags before 1964 were notched, while after that year they are not. Barbara Freethy’s book Daniel’s Gift inspired me to think about how our lives are interconnected. Thanks for an reflective blog. Yesterday I went through the list of inspy romance authors and wrote down what books I have read by each author. I especially enjoyed the boxed sets. Unfortunately I have not read one of your books. I live in SW Michigan and on a clear cool evening at sunset, we sometimes see Chicago from our shores.I also lived in Chicago area from 1979 to 1989. Will have to read your book about Grant Park. Renate, there is always a typo, isn’t there? Sigh. Thank you for catching that. What an inspiring post, Sally. I agree that there can be truth in fiction. Sometimes it’s easier to teach through a story than through a factual account. I hadn’t heard of Karen Ball’s book; ordering it and KEPT, which I haven’t had the chance to read yet. Thanks, Lee! I hope you enjoy both books. Stories can definitely get the point across, can’t they? I love to read stories where the hero or heroine grow in their faith, or have lost faith due to circumstances or an event that caused them to turn away from God. It’s fun to write them too! Happy New Year to you too, Jill! I know I’m pretty much a fiction only girl. I could learn stuff from non-fiction–if I read it! I love that God can use fiction to make us stop and think. I enjoyed reading your post. I learn things when I read a book. I have learned facts or new words without studying a subject! Reading definitely expands your knowledge and it’s fun! I enjoy historical fiction for this very reason, there’s always something new to learn. When the characters and/or the premise of the novel stay with me long after I turned the last page, the reading experience is that much more rewarding. Catherine West’s Yesterday’s Tomorrow gave insight into what it was like to be on the ground in Vietnam. I’m embarrassed to admit there’s very little I know or understand about that part of our nation’s history. I found the plot to be gripping and of course the romance was delightfully well-written. It also made me think a lot about waiting and consequences of choices, etc. Great post, Sally! Heidi, I so agree with you on Yesterday’s Tomorrow! Really a great, eye-opening book. Loved it too. As I kid I loved to read the Baby-Sitters Club series and I was forever learning new things from those books, a lot of which I still remember today. I know that I’ve also learned things as an adult and one of the most recent examples was learning about the 1893 Chicago World’s Fair from It Happened at the Fair by Deeanne Gist. I’ve learned a lot of facts from fiction as well, but the kind of truth I love to discover in fiction (and try to weave into my own) is something that meets me where I am spiritually. Story is like a parable in that it can show a scenario and its outcome in a way that sticks with a reader. It comes in under the radar but can be very powerful. Like someone else said, that’s the beauty of historical fiction. I just finished Laura Frantz’s The Mistress of Tall Acre, and she gave a peek into life after the Revolutionary War before the government we have now was established. Interesting stuff! Very interesting about Spain and Hitler. My great Grandpa who was Russian took my Grandmas name(Polish) so that they could escape the war and flee to America. A Lady in Defiance by Heather Blanton and of course your book Kept and A Man of Honor by Loree Lough taught me a ton about forgiveness, love and that God’s grace is all encompassing. I have learned a lot about states, landmarks and neat points about history in fiction books. love fiction because you get a story along with the facts. Do you have a new book coming out following Kept? I really loved the character Miska Tomlinson And Dillion. Jenny, I’m thrilled to hear how Kept touched you. And I love the story about your great-grandparents. That’s a book right there. I’m working on a follow-up to Kept, but it’s slow going due to homeschooling–those kids gotta learn!–and some health issues. I’m hoping I’ll have one book out this year. Thanks for asking. It seems like almost every book I read, whether nonfiction or fiction, touches me in some way that hits home. Often they confirm something God’s recently shown me. Sometimes they teach me something completely new and I have to pause in my reading to soak it up. It’s funny, but even though it shouldn’t still surprise me (because it’s happened so often), it usually does take me by surprise and leave me a bit speechless. But then, that’s God for you. If I ever cease to be amazed and surprised by Him… well, I just hope I never do! Yes! God’s timing in what I hear in church, what I’m reading for fun, my devotions–it’s pretty amazing sometimes. I enjoyed your blog post. I also learn actual facts from reading fiction. I read your book Kept last year and enjoyed it so very much. That’s what I love about Christian fiction, for all the elements you’ve mentioned. But most of all, because when an author can challenge me to grow in some capacity spiritually! Isn’t that the goal in Christian fiction and for authors who write in that, to be used of God to send a message to the reader and challenge or change them in some way? It bears repeating for me, I SO appreciate Christian authors who stick to their faith & never compromise (or water down) their writing. I also love learning history through fiction. Some tidbit I didn’t already know. It challenges me to look up that piece of history to learn more about it. I’ve learned more by reading than I ever did in school! I can’t really name a book that has recently challenged me, it seem that every one I’ve read has a different Christian theme to it, so it challenges me in many ways. To be more Godly in my dealings with people (more grace & mercy), more willing to forgive easier, to rely more on God to help me through sticky situations, and look for opportunities to be a witness to Him in my life. To sum it up…..show the Fruit of the Spirit in my life so other people will see it! Me too, Sheila! I love books that are real that way. I love reading Christian fiction for the fact that they usually draw me closer to God, or get me to look closer at something I thought I knew. Stephanie Landsem’s books have really opened my eyes to Jesus’ time on earth and my relationship with him. The Tomb really opened my eyes to some things. Also, Joyce Swann’s The Warrior was a fascinating read. It’s about praying for someone you don’t know. This book opened my eyes to the power of prayer. Thanks for a great, encouraging post, Sally!